A few weeks back I made this big stink about writing more frequently and yet since that time I have wound up writing less than ever. I haven’t cooked anything new. I’m still in the office a million hours a week. And now I’ve taken on a second job, albeit a small one at one night a week, as a Quiz Master. So, I’m writing today, dammit. I’m trying to find meaning and balance in my life. I say “meaning”, maybe that’s a bit harsh. I am an adult now, which is easy to claim on the basis of age, but much harder to grasp in terms of…everything else. I have no children because they are expensive. Also, they smell, but I could probably get over that. I do not feel settled in my career because when you’re a child there is only the want to be. To be an astronaut, a veterinarian, a doctor, a teacher, a lion wrangler, something definitive, something viewed as great, and you’re blissfully unaware in youth of the lesser positions, such office administration, personal assisting, the horrible world that is retail, etc. You think everything is fair, that you work 8:30am to 5pm, at which point you’re allowed to have a life and holidays off. And for working those hours you earn enough cash to afford said life, a vacation once a year, medical bills, the surprise of a car breaking down. The world has changed, however. And I am cranky for it. Where am I going with this? I don’t know. Maybe the world hasn’t changed. Adulthood – Something I’ve sparred with more than once on here. It’s hard to view one’s self as a true adult as I base my idea of an adult on my parents, who I viewed most while a child in the 1980’s. Also, at its core my life is one of learning, of being excited for art, history, the beauty, destruction, and evolution of our past. This blurs the lines of being an adult personally because one is supposed to let go of the loves you have as a child as you grow into maturity. As a child I loved learning, I loved museums. And I will not let go of those. Speaking of cores, we all have an inner voice within us. If we didn’t we wouldn’t be able to read silently. Boom. Inner voice. As we grow, mature, and learn this inner voices matures with us, is us, defines our rationals and decision making processes. Every once in a while, however, my inner voice isn’t me. That sounds bizarre and creepy. Scratch that. What I mean to say is that every once in a while my inner child speaks for my inner voice. 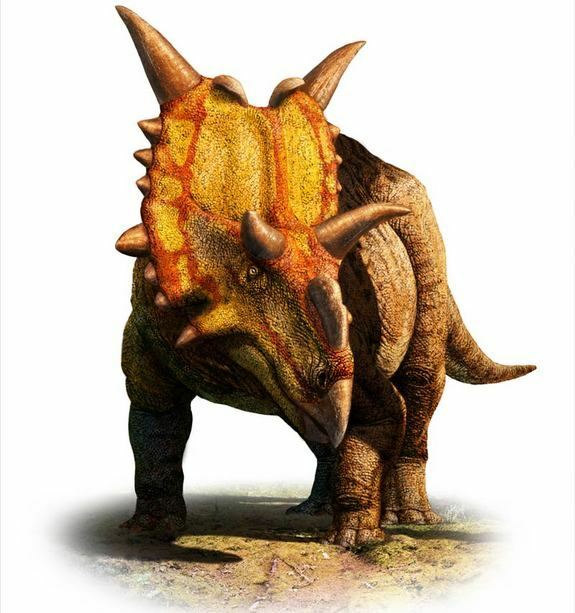 This morning I read an article about a new “Alien Horned” dinosaur discovered in Canada recently. It’s called an “Alien” based on it’s scientific name (Xenoceratops), Xeno of course being latin for Alien. Yeah, no, stop thinking Scientology. I mean, their use of Xenu isn’t exactly wrong, but it’s also not real. Dinosaurs were real (unless of course that offends you, but if it does then you probably wouldn’t be reading my blog). The point is the new dino didn’t look all that different. He’s instantly recognizable as a close relation to the Triceratops. And that’s my first thought on this matter. Not “My, a new relation of a classic. How interesting!”, not “A new discovery! How delightful!”, not “Oh, joy, something new! The World as we know it is astounding!” Nope. My first thought is that this is boring, because I would ride a triceratops and all of his or her kin like wild ponies of the Cretaceous Period. Big beast. I ride. He my friend. I call him “Friendy”. I say “girliest” because though I spent much of my youth working on farms just so I could ride horses, I would have much rather had a dinosaur or pterosaur as a trusty stead; ponies were just practice. This was me at my girliest. I love history, I respect history, I learn from history. Apparently, however, I will not grow out of my periodic inner child no matter how immature she may forever be. I don’t think I mind this, though. It’s that childishness that keeps me enthusiastic over the interesting things I love, and I find that joy to be easily contagious to those around me. Maybe it will even make me a good parent, if ever I decide to embark on that experience. I know it certainly made my father a good dad, albeit a pretty corny one. This entry was posted in Comedy, Entertainment, news, Pop Culture, Stories, Uncategorized and tagged adult, canada, child, childhood, cretaceous, dinosaur, education, funny, geek, learning, life, museum, nerd, new, science, story, triceratops, xeno, xenoceratops. Reverse Reese’s: Chocolate Stuffed Peanut Butter Cookies!